Working with a hammer to build a house will take weeks but with a porter-cable nailer, it takes few days. They’re powerful and is very useful thus raising the productivity for a number of nailing applications.Time-saving tools are used to drive nails in different surfaces, from wood, concrete, and metal. Each nailer is specifically designed for various types of nail and uses. This has resulted in different types of a nail gun project. There’s a handful variety to choose from and the framing nailer is just one of them. In addition, If you are working on wood siding, fence building, wood sheathing, or major carpentry, a framing nailer is the best one to work with. This type of nail gun is considered one of the heavy duty nail gun. The former can hold more nails while the latter can only accommodate fewer nails but is not restricted by building codes. The Porter-Cable FR350B 3-1/2-Inch Full Round Framing Nailer is in a class of its own. Its manufacturer also has numerous nail gun available on the market. This framing nail gun is one of their latest and also high-quality power tools. It features not only a new design but also an improved functionality that is ideal for woodworkers, carpenters, and DIY technicians. Out of the box, the porter-cable nailer also measures 21.65 inches in length with a height of 14.76 inches. Also, this tool spots a magazine with a capacity of 60 nails at any given time, a 22 degrees magazine standard size to the drive axis. In addition, the FR350B is essentially a framing nailer that is capable of driving large nails of up to three and a half inches into solid wood with no hitches. Since you want to choose or buy the best nailer, you must consider also the advantages of this product. This framing nail gun also boasts a trigger lockout which alerts the carpenter on the appropriate time to reload the magazine. 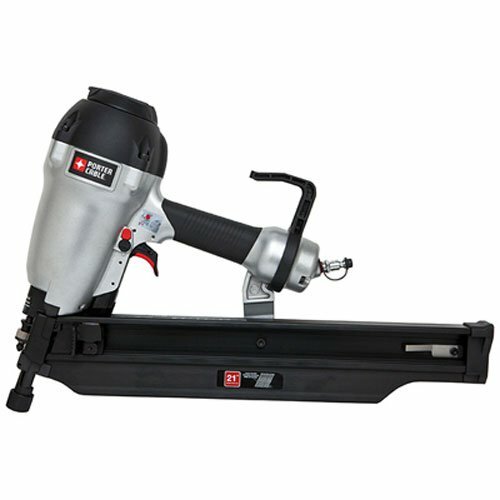 The comfortable grip features allow the user to carry on with the project without suffering from fatigue.Also, The 7.3 pounds is quite light if you take into account how much other framing nailers in the market weight. also, A 22-degree magazine translates to faster reloading time and less effort for more work. Finally, it is the minor additions such as the hanging rafter hooks that set the porter cable framing nailer apart from the competition. Since You know the advantages, you should know the Disadvantages of Porter-cable. A common complaint by many users is the fact that they find the security feature on this device too sensitive, you have to be keen and also precise to get the proper adjustments. Another drawback is that the gadget is somewhat bulky and long. This factor also makes it cumbersome to operate in tight spots. The lack of carrying case might be a minor thing but it could’ve been better if the package includes one. We have gathered Amazon reviews of people who have bought/used this amazing porter-cable product. Find out what they have to say about this framing gun. “This is a great framing nailer and framers all know that, but the general public may not. “Nailing 3" nails is a joy. Even with my limited handy guy skills, the nailer produces pro work. Studying a wall in minutes and it was straight as an arrow. Except for the occasional proud nail (usually my fault), I may throw my hammer away. “So far I've only used this on 1 project and that is a white picket fence. I can only estimate, but I'd say it saved 3-4 hours of nailing time AND made life easier on my shoulders. I found the adjustable depth setting handy as the tips of the nails initially peeked out of the stud ever so slightly. The built-in "hanger" came in handle when moving rails and it rotates back out of the way once you are holding the nailer in hand. “I feel I should admit, right off the bat, that I bought my Porter Cable nail gun used on Craig's List. But that is part of my story because after using it to build my house, and then a tractor shed, also this nail gun is still awesome. In all of the use and abuse I've given it, it's only jammed once and misfired (two at once) two or three times. The jam was easy to clear. So now, Finally we can say that the Porter-Cable FR350B Framing nailer is packed with amazing features; and also it ticks all the boxes of a superb nail gun. It is easy to load also, lightweight and has safety features something every nail gun should have. There are a few complaints but nothing major to make you reconsider buying this tool.